Other Common Names: Southern wormwood, lad’s love, old man, slovenwood, tangerine southernwood, Eberreis (German), aurone (French), abrótano macho (Spanish), åbrodd (Swedish). Habitat: Southernwood is thought to be native to southern Europe and Asia (Turkey, Middle East, and Iran). The species was introduced to North America by the European settlers and soon became naturalized. The plant prefers full sun in a dry, nutritious and porous soil. Description: Southernwood is a perennial half-shrub that belongs to the daisy (Asteraceae) family. 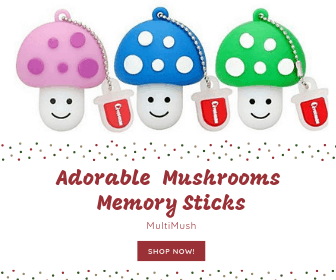 It has dense branching and woody stems and can grow up to 1.2 meters in height. The leaves are gray-green, smooth on top and downy underneath with narrow lobes. The spherical yellow flower heads are composed of tubular florets. The fruit is a small, inconspicuous brown nut. The plant has a strong, sweet and penetrating aroma, reminiscent of lemon. Plant Parts Used: It is the leaves, fresh or dried, that have been used as herbal medicine. The leaves should be collected before the flowering and dried in a shade to prevent the loss of color. The dried leaves should be stored in sealed glass containers and kept away from light. The leaves contain 0.5% essential oil (1.8-cineol and other substances), tannins, bitter substances (in the form of lactone artemisinin), an alkaloid (abrotanin), flavonoids, phenolic acids (chlorogenic acid, coffee acid, folic acid, vanillic acid, salicylic acid, etc.) and coumarin derivatives. Today southernwood is rarely used as a medicinal herb, but it was highly valued as such in the Middle Ages. 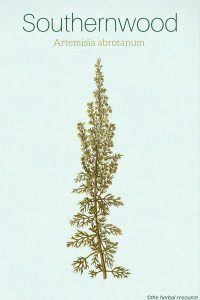 Now it is wormwood (Artemisia absinthium), a closely related species, that is preferred in modern herbal medicine. Both wormwood and southernwood contain essential oil with powerful insect repellent properties. In the past, it was not uncommon to put the leaves in closets and cupboards to keep moths away. Bouquets or potpourris containing the herb were often placed in kitchens to keep flies at bay. Additionally, the fresh leaves were rubbed on the skin to ward off mosquitos. Southernwood was used traditionally for cramps, urinary disorders, menstrual pain, and cough as well as an antidote against snake bites or other poisonous animals. The herb was also used as a remedy against the plague and intestinal worms. In the past, the plant was used as folk medicine to treat various skin diseases and was thought to promote beard and hair growth. It was often placed in pillows to counteract insomnia. One of its traditional uses was to soak the leaves in warm water often combined with nettle, rosemary or sage and then rub the extract into the skin and scalp to prevent infection. For centuries the herb was regarded to have magical powers and was used as a protection to ward of evil. In many Catholic churches, the herb is still used as incense. 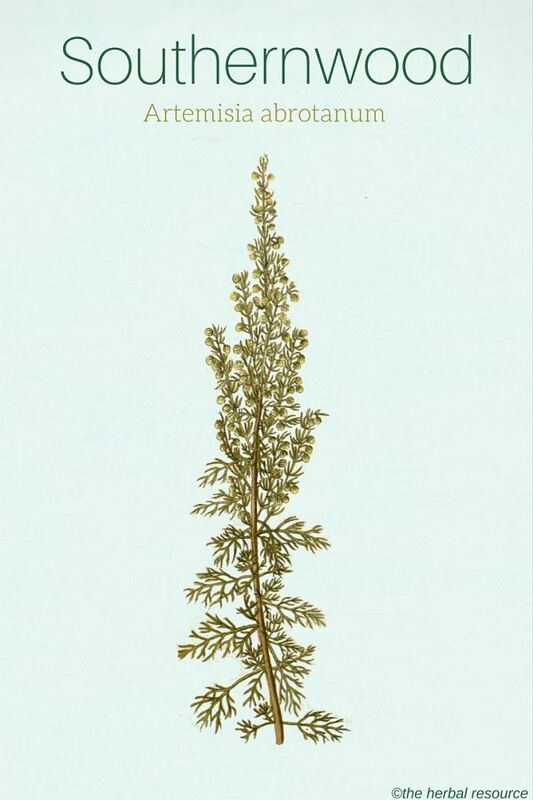 Southernwood is a bitter herb that is believed to have many medicinal properties. It is thought to strengthen the digestive system by increasing the production of the digestive juices. Many herbalists were known to use it, and some still do, as an internal remedy in tea form to treat loss of appetite and indigestion (dyspepsia) associated with inadequate bile secretion. It has also been used for diarrhea, urinary tract infections and for bronchitis and other upper respiratory infections. The herb may be used as a sedative in nervous gastrointestinal disorders and it may be used in the same way as other Artemisia species to regulate irregular menstruation. Externally, southernwood can be used in the form of a decoction or compress for chilblains, swellings, abrasions and to stop bleeding and promote healing. The herb is thought to increase blood flow to the skin and to have an anti-inflammatory and disinfectant effect mainly against fungal diseases. The fresh or dried leaves can be used in spice mixtures and traditionally it was used as a flavor ingredient in the same way as wormwood in herbal vinegar and some liqueurs. Due to the lack of information on the correct dosage of this plant as medicine, it is vital that a trained herbalist is contacted prior to use. 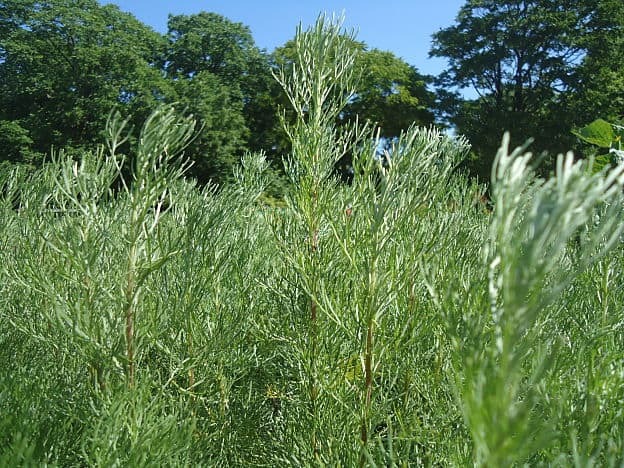 In some literature, it is stated that the normal dosage of southernwood is around 4 grams of the dried herb or the equivalent in the form of an extract, which may be used up to three times daily. Southernwood, just as wormwood (Artemisia absinthium) and mugwort (Artemisia vulgaris), has a reputation of causing miscarriages and have a stimulating effect on the uterus so it should not be used during pregnancy. Children under 12 should avoid internal consumption of the plant. 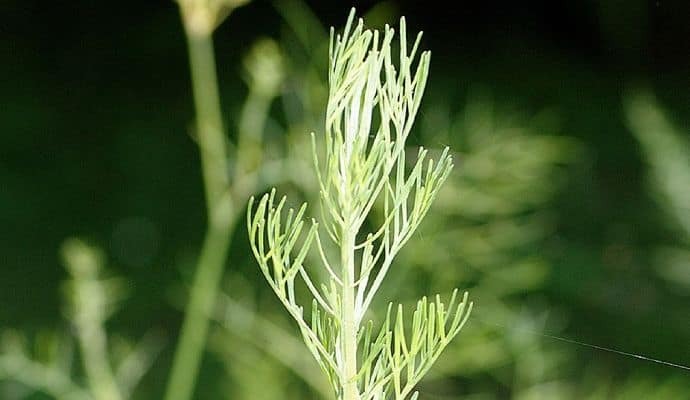 In some instances, plants belonging to the genus Artemisia are known to cause both skin rashes and allergic reactions so caution is advised when handling southernwood. Bown, Deni: The Royal Horticultural Society New Encyclopedia of Herbs & Their Uses. London, Dorling Kindersley. 2002. Ody, Penelope: The Complete Medicinal Herbal. London, Key Porter Books. 1993. Thomas, G. S: Ornamental Shrubs, Climbers and Bamboos. Frances Lincoln. 2004. Skenderi, Gazmend: Herbal Vade Mecum. 800 Herbs, Spices, Essential Oils, Lipids Etc. Constituents, Properties, Uses, and Caution. Rutherford, New Jersey, Herbacy Press. 2003. Stuart, Malcolm: The Encyclopedia of Herbs and Herbalism. London, Orbis Publishing. 1979. Volák, Jan & Jiri Stodola: The Illustrated Book of Herbs. London, Caxton Editions. 1998. Williamson, Elisabeth M: Potter’s Herbal Cyclopaedia. Essex, Saffron Walden. 2003. Chevallier, A: The Encyclopedia of Medicinal Plants. DK Publishing. 1996.